Another game, another contentious decision goes against the Clarets, but they'll still enter the New Year in seventh spot in the Premier League and seven points ahead of their nearest rivals. Sean Dyche's side brought the calendar year to a close with another clean sheet and a point away at Huddersfield Town but it could've been so much more. A 10th blank of the campaign, and a 16th of 2017, typified Burnley's organisation and discipline this term but the visitors will be left reeling after another key decision went against them. Burnley, who have now accumulated 17 points away from Turf Moor, have fallen foul to a number of decisive moments this season, with Bernardo Silva, Aaron Ramsey and Dele Alli all winning debatable spot kicks, but they were denied a stonewall penalty of their own on the 21st outing of the season. The Clarets were dominant in the first half but failed to capitalise on their multitude of openings against a Terriers side that lacked both bark and bite. The visitors grabbed hold of the game following an uncertain opening 10 minutes at the John Smith's Stadium with Collin Quaner going close to breaking the deadlock. The former Union Berlin forward finished an electrifying burst to the edge of the box with a powerful drive that Nick Pope flicked over the crossbar. Jonathan Hogg also had time on his side minutes later when Ben Mee's headed clearance dropped for him on the edge of the penalty area but the Town skipper failed to hit the target. Burnley soon found their groove, however, and Jeff Hendrick saw his effort ruled out for offside when tucking in the rebound once Jonas Lossl had kept Kevin Long's header out. By this point Johann Berg Gudmundsson was proving a menace for the home side and the Iceland international looked odds on to score when carving his way between Scott Malone and Hogg but the winger slid the ball wide of the upright. The one-time Charlton Athletic man was at the heart of the away side's next attack, picking out Steven Defour in space but, having gained entry in to the box, the Belgian midfielder dragged his shot just wide of the post. The only criticism of the visitors was that they hadn't made Lossl work and that was the case again when Scott Arfield, returning to face his former employers, failed to test the Mainz loanee with a glancing header from another Gudmundsson delivery. In the closing stages of the half, Gudmundsson picked Barnes out inside the box but Rajiv Van La Parre stuck out a boot to prevent the attempt from troubling Lossl. A similar pattern of play was repeated after the interval but the Clarets once again just couoldn't put the game to bed. Arfield looked favourite to find the net when wriggling his way in to the area but Lossl was on hand to pull his side out of the mire when spreading himself to produce a fine save. The talking point of the fixture came just after the hour when Arfield and Hendrick combined to work an opening in the box but when the latter went down under the challenge of Lossl referee Paul Tierney awarded a goal kick. 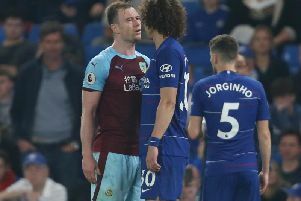 The midfielder had taken the ball around the goalkeeper at the bye-line only for Lossl to sweep him off his feet when making contact with his standing leg but nothing was given and Dyche was furious on the touchline. Nahki Wells was introduced to try and make the difference against his former employers and, with the clock ticking down, he was denied by the legs of Lossl from close range when getting on the end of substitute Sam Vokes's headed assist. The Welshman also went close to snatching the points in time added on when getting ahead of Lossl to meet Bardsley's cross but the striker powered his header wide.